The buzzard hide continues to be active into November with the birds coming down and staying for a good 30 minutes at a time. Initially the magpies were first down to the bait but watch the right hand side of the video closely and you'll see the Juvenile Buzzard coming into the shot low to the ground to arrive at the perch. 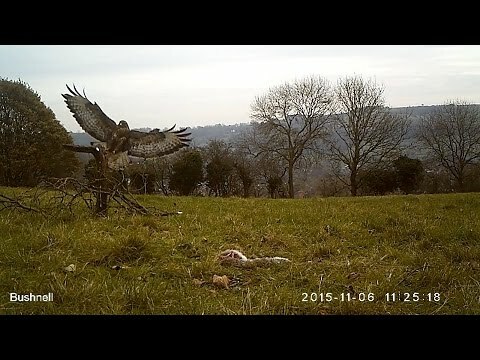 It's not long before the buzzard asserts its authority over the magpies but watch as one of them tugs at the buzzards tail, harassing it to move on and free up the food. From previous videos, you can see the buzzards visit the hide at varying times throughout the day and most mornings I see them drifting past overhead.